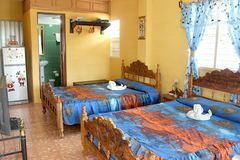 The Hostal La Artesana is a family house in the city of Trinidad, located near the bus stop to Playa La Boca. 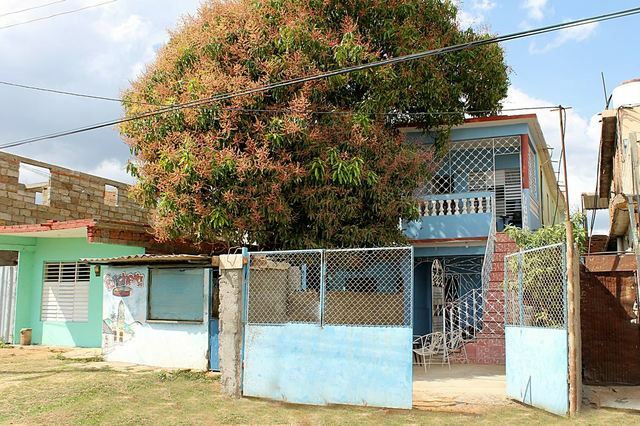 The owners of the house have prepared for rent a spacious room on the second level, heated with a split, also has a wall fan and 3 large windows that allow the entrance of the soft tropical breeze of the Caribbean. At the entrance to the room there is a balcony with tables and chairs that is for the exclusive use of the guests. 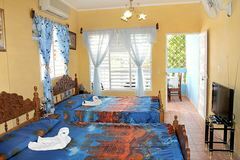 For more comfort the room has a TV and a refrigerator stocked with soft drinks, beers and water. The bathroom is private inside, is provided with soap, towels, shampoo and toilet paper. The garage is included. The hosts respect the privacy of guests but are always available to help and recommend the best places to visit in the city, in addition to suggesting trusted people of the house and connoisseurs of the city and its surroundings to accompany the guests on excursions and Activities related to tourism. The lady of the house belongs to an artistic project together with a renowned painter of the city Yudith Vidal Faife, is in charge of the embroidery that is made to the paintings of this great artist. In the house you can find samples of his works and embroidery. The home phone can be used free of charge for local calls and to guarantee the next destination. Book with this wonderful family and inform the family of your arrival time and will be expected at the point of arrival. Address : carretera La Boca # 7-A entre Línea y Subplanta.